Story (from IMDB) : A Wall Street investment banker who has been set up as the linchpin of his company’s mob-backed Ponzi scheme is relocated with his family to Aunt Madea’s southern home. 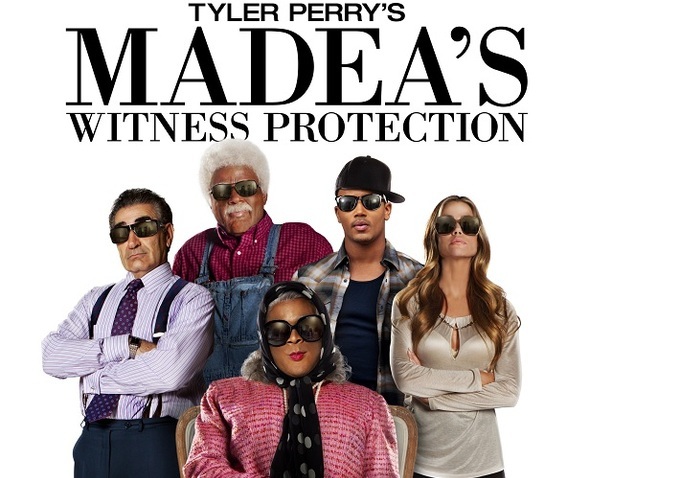 My hatred towards not only Tyler Perry but towards his entire off spring brand of Madea films caused me to finally watch a Madea movie to see what its all about. Thankfully I see I’m not missing much. The story follows a investment banker where after finding out his company is a ponzi scheme with ties to the mob is put into a witness protection program. His family however lands with Madea and the zany fun starts from there. Really though isn’t a lot of zaniness or fun. The thought that the a federal agency would let a agent place a witness protection family into a family members house is unbelievable. From here though the film just seems to tie together random events that one would think might be humorous but aren’t. Also throw in side plots involving a church fundraiser that lead up but never once are interesting. You never get the feeling that any of it has a barring in the story. Humor wise too the film just doesn’t hold up. It feels like it this was made maybe in the middle of the 1990’s it would work but the humor just isn’t anything new. A lot of jokes about white people and black people. Not even offensive or crude jokes either. Throw in fart jokes, jokes about old people and their memory loss, and scenes involving bad disguises and accents. There were very few scenes that made me laugh and those laughs were from dumb humor. Acting and cast wise the film isn’t any better. I enjoy Eugene Levy but his acting in this is horrible. I’ll openly admit my hate for Tyler Perry always. He plays multiple roles in this film. Him as a agent is bad and him as Madea is horrible. Nothing is funny about him in drag as a woman. It’s disturbing and this isn’t the 90’s and early 2000’s where a film like this is would be popular. Denise Richards though is by far the worst and most cringe worthy in this movie. Her acting is forced and just acts like sometimes she doesn’t know what is going on or if she she is even sure that the camera is rolling. Overall I really can’t recommend it. With bad acting, a lackluster story, and humor that mostly flops the film has little redeeming value to it.